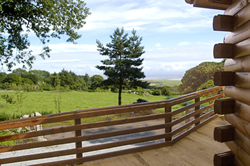 The great room has a commanding view over the Solway Firth, comfortable sofas, digital TV, DVD player, books and radio with stereo CD. 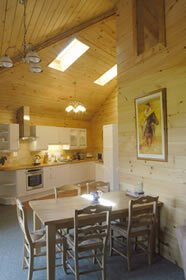 The inside of the lodge is attractively finished in natural pine. Patio doors lead outside on to a timber veranda with seats to relax on and a teak table & chairs for your sunny breakfast. 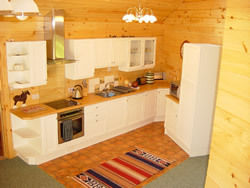 The kitchen has electric oven, hob, dishwasher, microwave, fridge freezer and a dining table for 6. There is a separate utility room with washing machine, tumble drier and sink, with plenty of space for boots, wet coats, golf bags, prams and buggies. The master bedroom has a king sized bed and an en-suite shower room. 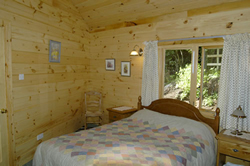 There are two further twin bed rooms and a large bathroom. 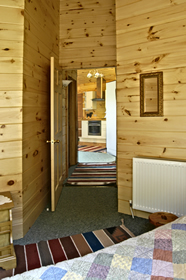 All rooms are tastefully appointed and characterful. 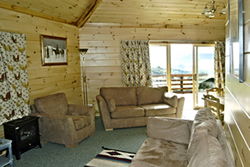 The lodge is very warm and cosy with central heating. 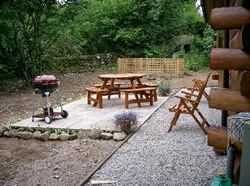 The lodge has a private garden including a west facing patio and barbecue area. 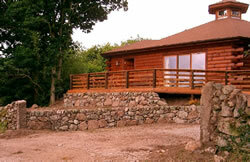 The lodge is well suited to family groups and young children. All heating and electricity charges are included. 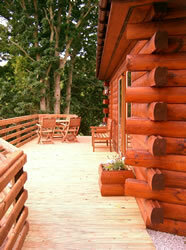 The lodge does not have a telephone but mobile reception is generally good. Free range eggs, asparagus, strawberries and new potatoes are available from the farm when in season.